The experienced visitor to Paris will know the drill when it comes to the city’s hotels: a compact reception area that doubles-up as lobby and breakfast room; no hotel bar—hardly necessary in Paris; impossibly tiny lifts that are barely large enough to accommodate the modern traveller’s new suitcase—let alone the modern traveller and their suitcase; and cosy, compact rooms, whose bathrooms have a smaller footprint than the wardrobe you just hung your clothes in. 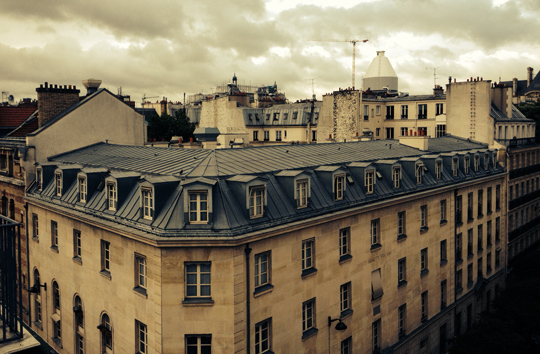 Over many years and numerous trips to Paris, there have been two occasions on which I’ve lodged in rooms on the top (usually sixth or seventh) floor of hotels occupying the city’s distinctive nineteenth-century apartment blocks. Staying on the top floor of such establishments can present an additional spatial challenge to the visitor to Paris, thanks to the mansard roofs often found on such buildings. On the first occasion the hotel in question, situated just off the Boulevard Haussmann in the eighth arrondissement, was a rather tired, budget affair, last decorated in the 1970s. The walls of our top-floor room were decorated in an electric blue velour, and the dingy bathroom, which was set in the outermost corner of the mansard roof, had a shower that, thanks to its inward-sloping walls, could only be used if you were prepared to squat in the bathtub with your head between your knees. More recently, while in Paris to celebrate our first anniversary, my wife and I stayed in a hotel in the fifth arrondissement, not far from the handsomely gothic church of Saint Severin. This hotel was a decidedly more salubrious affair, having most definitely been refurbished within living memory. Furthermore, its lack of mansard roof meant that we were barely aware of being on the topmost floor, until we took in the view from the window or stepped out onto our small but perfectly amenable balcony area, from which it was possible to glimpse an aspect of Paris that only other hotel rooms such as this one could afford. 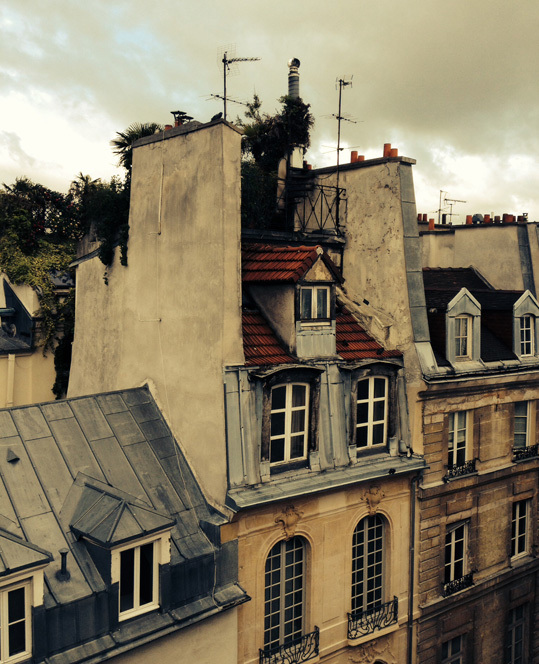 The view from the balcony made me realise that the rooftops of Paris are a world in themselves, with their own unique architectural language, a language that—on the day in question—was being brought into sharp focus by the leaden, stormy skies that had followed us from London. 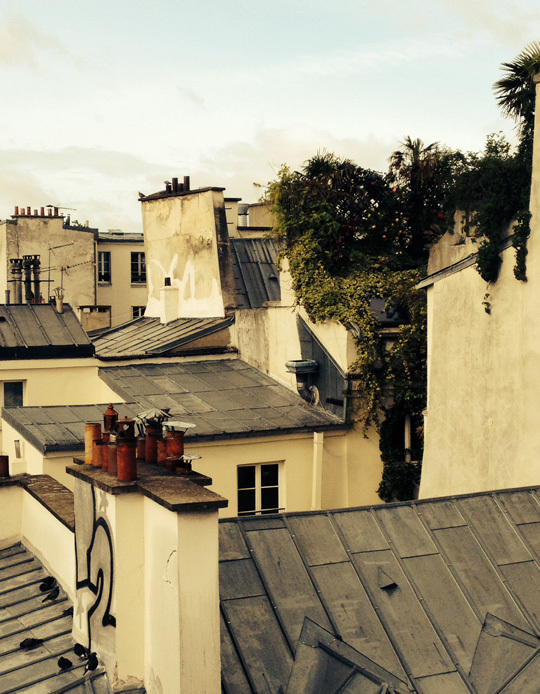 I was fascinated by the fractured landscape of sloped lead roofs, gables, graffitied walls, rooftop gardens and bricolages of chimney pots and television aerials; a largely unpeopled world, which brought to mind interventions like those seen I’d seen in films such as Moulin Rouge, Delicatessen and Frantic. Our height helped dampen the drone of traffic below, reinforcing a sense of isolation, and the details of crumbling walls, rotten window frames, and foliage emerging from the all manner of niches, reinforced the notion that the rooftops are a buffer zone, mediating between the civilised comforts of humanity below and the capricious nature of the elements above.